The origins of this celebration are unclear. Some say that this day commemorates the abolition of the Moorish requirement that 100 virgins be given every year as tribute from Christian Kingdoms in Iberia. (Each village had to give three as their participation in the tribute); Others say that it comes from the cult following of the goddess Ceres, goddess of harvest and agriculture as well as Celtiberian priestesses, who offered the results harvested from the soil during the celebrations of devotion to the sun. 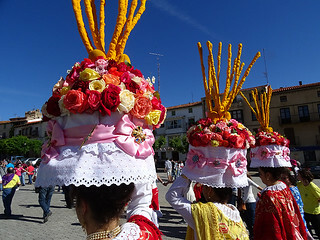 During this day they carry a ‘cestaño’ or wicker basket on their heads containing flowers and the ‘Arbujuelo’, which are wands covered in flour and coloured with saffron, representing fertility. Different events mark this day: The ‘Caballada’ and The ‘Descubierta’, during which local dignitaries ride on horseback dressed in in ceremonial attire, when passing in front of the ‘Móndidas’, the latter open and close their fans whilst the dignitaries remove their Bicorne hats. The ‘Ofrenda del Arbujuelo’ is celebrated at the Romanesque shrine where the fire walking had taking place the previous evening. The baskets are given to the virgin and during the mass the three “Móndidas” pass the “arbujuelos” to the priest and the dignitaries, following a ritual where they are unable to move back towards the altar. In the meantime, the young men of the town erect, with great effort and coordination, a tall, straight tree trunk from a ‘mayo (‘poplar) in the main square. This event is called ‘La pingada Del Mayo de los Quintos’ as a reminder of the days of Military service. Some minutes after the mass the Móndidas and the dignitaries arrive and ‘Cuartetas’ (poems) written for the ocassion, are recited by the Móndidas and then, as a finale, each of the ‘móndidas’ dances ‘jotas’ (regional dances) with the dignitaries. Click here to see the 2nd post about this festival: Firewalking at Saint John´s Festival, San Pedro Manrique. Do you know of any other festival in which the ‘peñas’ (groups of people who join forces to celebrate an ocassion) invite foreign people to go into their locals and share a drink? I was asked the same question several times. On the eve of Saint John, the music of the bands accompanies everyone from “peña” to “peña” toshare some beer or ‘Zurracapote’ (red wine with fruit, sugar and cinnamon), and then the Móndidas are taken to their homes where ‘mayos’ decorated with garlands indicate that the Móndidas live there. More drink and food awaits the procession. It was a really fun evening, I had the opportunity to get to know the ‘Móndidas’ and, the following morning, to share with one of them the time of the dress “code”. Two seamstresses are assigned to each girl and while they were working on the girl I was told some “secrets” about the Móndidas. In the past they were young virgins born in the village, but due to the modern young life styles and the lack of suitable women, this requirement is now overlooked.